Download Warm Bodies in Digital HD from the iTunes store. Warm Bodies images are © Summit Entertainment. All Rights Reserved. 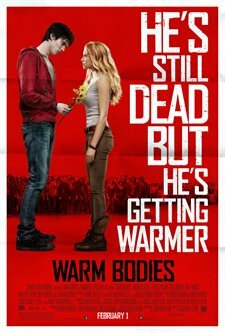 A nice job with a Romeo and Juliet theme, Warm Bodies shows what a imaginative writer/director can do with a zombie love story. The slick little romancer creates fun out of terror and sends a lot of subliminal messages. Perfect for teens to twenties, it's the perfect modern day date movie with both sexes looking for fun and some creative horror. The USA has turned its population into zombies following an epidemic, germ warfare or other catastrophe of massive proportions. Only a small city has survived behind tall walls and armed with a militia that's ready for about anything. Squads have been sent to seek food and medicine outside the walls and on this one occasion Julie (Teresa Palmer), the daughter of the militant leader Grigio (John Malkovich), has joined the group of searchers. The undead have been attacking these people and killing them for food, their brains being the best nutrition and they happen on Julie's squad where a fight breaks out. R (Nicholas Hoult) one of the zombies spots Julie and for reasons he can't understand saves her from the other ghouls. Taking her back to an airplane that's his living quarters, R tries to make her understand that he can keep her safe. After finally communicating with the girl and convincing her she mustn't try to escape in the dangerous area, Julie settles down. When a strange attraction begins to develop between the two and R starts to change, they set up a plan to save what remains of the planet. 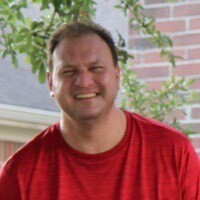 The lovelorn R becomes comical as he begins to change from brain eating to almost human while his captive Julie tries to make sense of why she's attracted to this ugly ogre. It's Beauty and the Beast meets Romeo and Juliet with the actors and the production company taking the age old story and putting it into a modern day setting. The film shows violence at times with the undead feasting on the people and skeletal zombies eating the undead, yet there's a lot of tongue in cheek comedy to keep the film light and measurably free from unbridled terror. The unconventional relationship developing throughout however, keeps the film loveable making up for the gory scenes that are only there to emphasize some of the action. The first five minutes of Warm Bodies are a hoot and set the tone for what will be a very funny and creative film. The main cast's acting skills are on fire with Hoult and Palmer showing a lot of chemistry in their performances as ‘the star crossed lovers'. Adding a lot of nicely placed comedy, Analeigh Tipton (Crazy, Stupid, Love.) as Julie's best friend Nora and Rob Corddry (Children's Hospital) playing M who's R's best zombie pal show their comedic talent with remarks and gestures that come during some of the most dangerous situations. Even John Malkovich makes an appearance as the concerned dad who doesn't seem to understand why his daughter is taking up with a ghoul. Writer/director Jonathan Levine's (50/50 and The Wackness) script is so scathingly cool saying a lot about how we live without having to come out and tell us. I love R's walk through the airport with Levine showing his past. It's A testimonial to our technological idiocy with everyone texting, gaming or watching a video. The astute director shows that we are already zombies we just don't eat human brains or smell of rot. R says "What am I doing with my life? I'm so pale. I should get out more. I should eat better. My posture's terrible. I should stand up straighter. People would respect me more if I stood up straighter. What's wrong with me? I just want to connect. Why can't I connect with people? Oh, right it's because…" I'm an incessant computer gamer (my words but the meaning is there). The musical sound track has all the right songs with Jimmy Cliff's "Sitting in Limbo," "Missing You" performed by John Waite, Leslie Feist's "The Bad in Each Other", "Patience" performed by Guns N' Roses, Bruce Springstein's "Hungry Heart" and more. Bob Dylan, Bon Iver, Scorpions, Roy Orbison, M83 and The National all contribute to add to the film's wide appeal. Warm Bodies has been rated PG-13 by the MPAA for zombie violence and some language. Although the film target's horror enthusiasts who enjoy TV's "The Walking Dead" Warm Bodies reaches out to a wide audience including romantics, action seekers, all teens to twenties and more. me and my bff Aliza went to go see it,it was awesome!!! :)a must see!